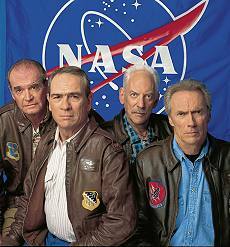 Clint Eastwood, Tommy Lee Jones, Donald Sutherland and James Garner play a group of test pilots left on the ground while the Mercury and Apollo astronauts got into space. Fortune smiles on them when a Russian satellite is falling from orbit and only Frank Corvin (Eastwood) can fix it. Somehow the Russian craft has his Skylab guidance system. Corvin insists that old nemesis, and now NASA executive Bob Gearson (James Cromwell) allow his team (Daedalus) to take the shuttle on its rescue trip. The genre term Space Opera for a particular kind of rootin' tootin' boys own science fiction space adventure is a hats off to its similarity to the Horse Opera cowboy stories. So it isn't all that surprising to find Clint Eastwood directing and acting in Space Cowboys -- a prime example of the genre. In keeping with the tradition of space operas, the plot line is simple replete with obvious heroes and villains, high adventure and noble self-sacrifice. Shades of John Glenn here we have a group of yesterday's adventure hero actors playing a group of yesterday's heroes -- test pilots with The Right Stuff. On one hand it's a nice change to be free from today's Ken-doll heroes with their unbelievable plastic torsos, on the other it's testosterone past use-by date, and wrinkles and leathery skin as far as the eye can see. Space Cowboys doesn't just stop at having throwback astronauts, it also has throwback casting. All the female casting is love-interest girlie parts. Their jobs might be responsible and high-tech, but their human value and importance is low. Marcia Gay Harden stars as NASA Mission Director Sara Holland, the woman coordinating the flight to repair the Ikon satellite. She is the love interest for Hawk, Tommy Lee Jones' love interest, and has the most to do. Films that the filmmakers enjoy making usually have that joy shining through. 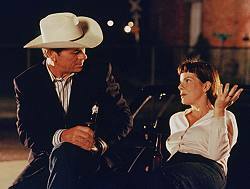 Speaking about Eastwood as a director, Tommy Lee Jones says, "Clint enjoys cinema and is determined to enjoy it, so everybody has a good time making his movies. And of course, the company I'm in, the actors, are all great fun. The uniqueness, the pleasure of this company extends certainly to the camera crew and the grips and costume people and everyone else working on this production." Ultimately this film doesn't bring anything new to the screen, it is just a plain old space opera -- but then that's the whole point: old Space Cowboys can still dream of not fading away. All movie photographs COPYRIGHT ã2000 WARNER BROS. PICTURES AND VILLAGE ROADSHOW FILMS (BVI) (ALL RIGHTS RESERVED). PHOTOGRAPHS TO BE USED SOLELY FOR ADVERTISING, PROMOTION, PUBLICITY OR REVIEWS OF THIS SPECIFIC MOTION PICTURE AND TO REMAIN THE PROPERTY OF THE STUDIO. NOT FOR SALE OF REDISTRIBUTION.